Submitted by Jeff Buster on Fri, 02/24/2012 - 19:32. 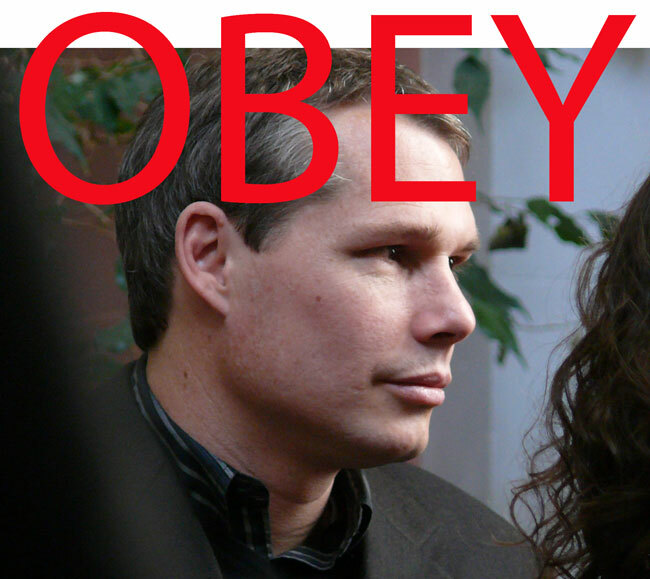 Today Shepard Fairey pled guilty in Federal Court in NY (link to USA Today) to criminal contempt for willfully deleting evidence and for concocting alternative evidence related to copy right claims of Associated Press for the original photographic image which Mr. Fairey used and modified to make the famous Obama campaign "HOPE" poster. You can read about the background to the copyright suit reported on Realneo here on 3.10.09 and about Mr. Fairey's Boston arrest for grafitti here on Realneo. misdemeanor and possible jail time? Submitted by lmcshane on Sat, 02/25/2012 - 06:30. AP President and CEO Tom Curley said in a statement: "Mr. Fairey started this case by suing the AP over copyright fair use issues. The AP never expected the case to take the turn that it did. The AP hopes that some good may come of this, by alerting judges and parties to the possibility that fake evidence may exist." Submitted by lmcshane on Sat, 02/25/2012 - 06:54. I will acknowledge that I swiped this photo and modified it--to advance a cause. As the saying goes...it's easier to ask for forgiveness, than permission. (I actually can't say who took the photo--I am assuming that this was originally shot by Satinder Puri). Submitted by Jeff Buster on Sat, 02/25/2012 - 12:26. 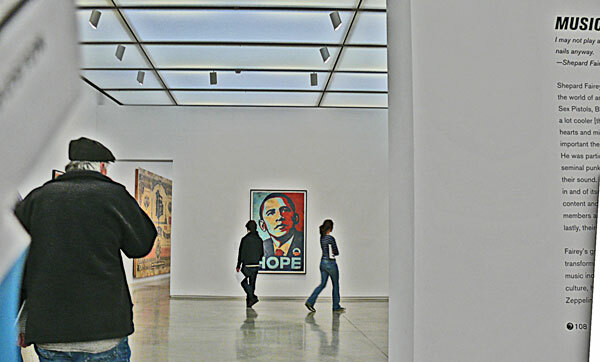 When the Institute of Contemporary Art in Boston, Massachusetts hosted the Shepard Fairey "OBEY GIANT" exhibit back a few years ago, part of the exhibit was a 1/2 hour looped video showing various parts of Shepard Fairey's studio, past events connected with Shepard's experience at RISD in Providence, RI, etc.. 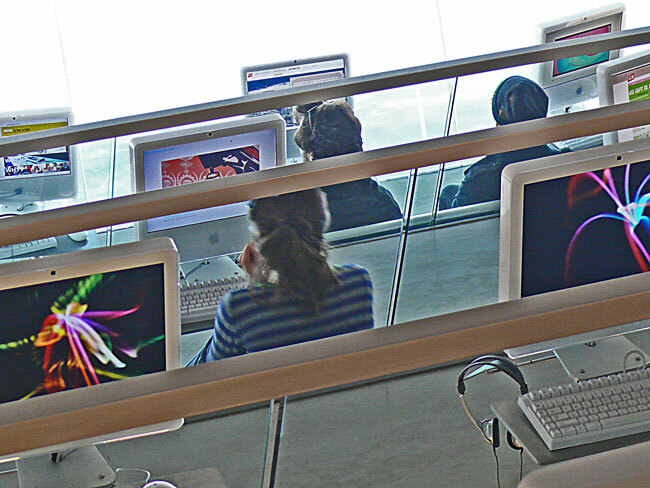 The video ran on a screen atat the back of the media lab pictured below. The museum viewers of the video stood to watch. Included on the video were some clips which showed faceless taggers placing "GIANT" graffitti in Boston. One of the clips showed fellows jumping over the turnstile fence in the subway tunnel at one of the Massachusetts Bay Transportation red line stations. The video then showed these fellows entering into a late night train and slipping out the advertizing cards in the car and slipping in The Giant. As I watched this part of the video I thought to myself - Wow, Mr. Fairey is kinda knuts, he has included video footage in his exhibit which shows people doing illegal stuff to install The Giant. Hubris could be a problem, I thought. Mr. Fairey's litigation with Associated Press originated from this same hubris. It is striking how our human flaws are so persistent in our personalities. I am sure I have similar persistant flaws. What are your persistent flaws which keep you off balance in life?